Marigold flowers give a burst of color to annual gardens. 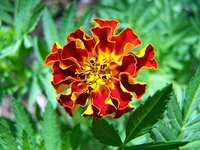 While you can purchase ready-grown marigolds at garden center, growing plants from seed allows you to explore lesser-known marigold cultivars and to experience the joy of growing flowers from seed. Marigolds fare well in garden beds, window boxes or container gardens, leaving you many planting options. Marigolds are a warm-weather annual, meaning the flowers are sensitive to the cold in springtime and need to be planted when frost danger passes for your area, sometime in mid to late-spring. You can either begin seeds directly in the garden bed when frost danger passes or, for an earlier garden, start the seeds indoors, then transplant the marigold seedlings outside when frost danger passes. To have an early garden, begin marigold seeds indoors two to three weeks before the last frost date for your region. If you don't know when this is, find a garden calendar for your state or county. Fill a seed-starting tray or a small container with seed-starting mix, then scatter your marigold seeds on the top of the seed mix. Cover them with 1/4 inch of seed-starting mixture, then moisten the mix thoroughly. Your seeds will germinate within a week, depending on the temperature. While there are many different types of marigold flowers, all can be started in much the same way. Marigold types for planting include African or American marigolds, which grow up to 3 feet tall and produce flowers up to 5 inches across; French marigolds, which have smaller, often bi-colored flowers and can reach 1 1/2 feet in height; and signet marigolds, which have fringed, fern-like foliage and grow up to 1 foot tall. Your marigold seeds need enough water to germinate, but not so much water that they drown or rot. Get seeds off to a healthy start by keeping the potting soil moist but not boggy, then re-wetting the soil to damp or moist when it dries out to the touch. Once the seeds have germinated and your marigold plants begin to grow, you can water more regularly to soak the soil. Yardener; Planting Marigolds; Jeff Ball et al.